We have 4 chicks about 4 weeks old now and they have taken over our laundry room (see 1st coop 2009 pictures) they refuse to stay in their plastic crate so it is imparitive that this coop is finished by the weekend! This is the first coop my DH has built and it is beautiful - he did a wonderful job! It was constructed primarily of materials he had collected here and there, except for the plywood, latch, extra shingles and hardware cloth. You can see all the ventilation at the top of the coop - we are hoping it will stay cool enough - may need to add a misting system next summer. He might also have to add some plexiglass for the "winter" if it gets too breezy - it rarely gets below 38 degrees so we are going to see how it goes. Brad found a dog kennel (6'x10') and designed a portable cover over it from some panels we recycled from our grapevine shades and 1"x 1"s to keep out the animals and provide some shade - it can be lifted off in two peices and new panels can be built as needed. 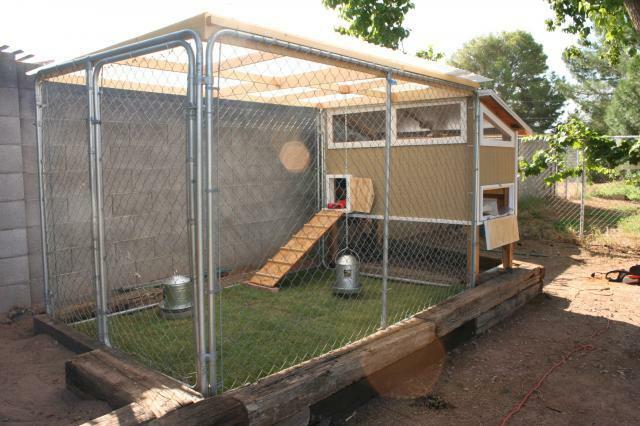 He will cut a hole in the chain link on this end where the door to the coop will be located so the whole yard can be utilized for the chickies. We also have four 6' panels we got for free that need new chain link and he will be adding those to the length once he replaces the chain link. 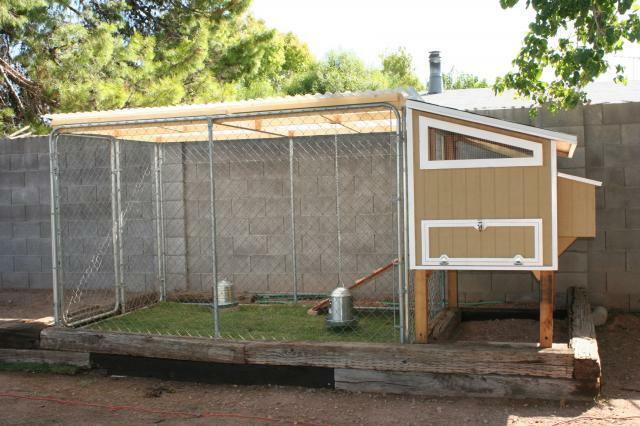 I will add a picture of the finished coop and yard in it's permanent home this next week. 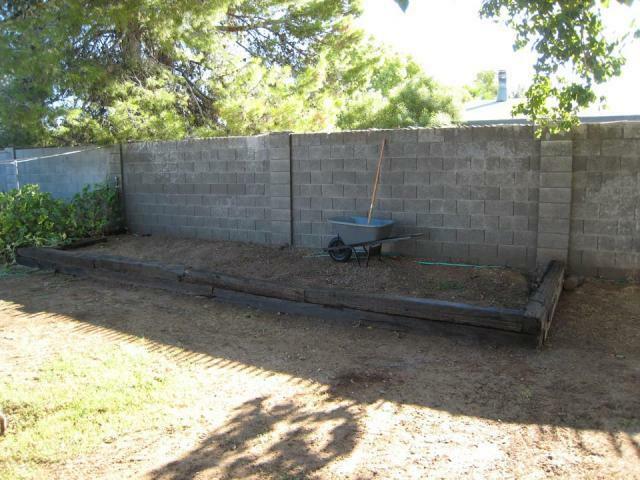 The whole set-up will be moved to this long wall (below) where one of my veggie gardens is located - it will give us an opportunity to let the chickens into the garden to eat the leftover veggies and greens. The coop and yard will be mostly shaded from our fierce desert sun by two trees - one to the South and one to the West. Here is the yard area - the coop will be at the end farthest from the garden and there will eventually be 6' chain link around the garden area (only 4' chicken wire now) and a gate so we can open the chicken yard directly into the garden. ...and trotted right into their new home. We have hay for bedding right now since my sister had a whole bale she couldn't use (free, yah!) and we put down sod for the initial covering as it was cheaper (and prettier) than sand - who knew! 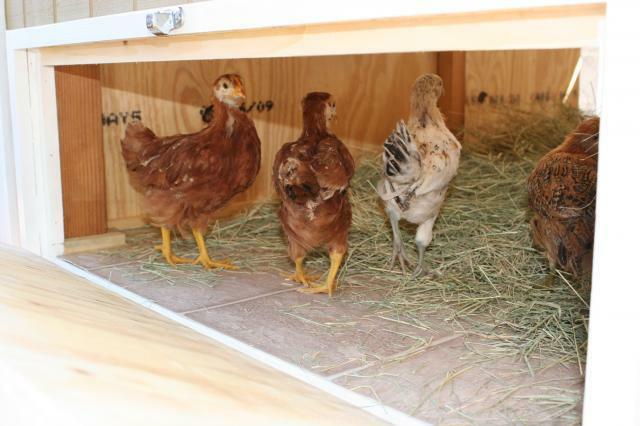 The chickens spent the first night in the coop and did ok with the heat of the day - I was very concerned but they had plenty of water and watermelon and they settled down pretty quickly. There is virtually no direct sunlight on the coop and only a small slice in the yard which helps to keep it cooler. They have water and food in both the yard and coop. 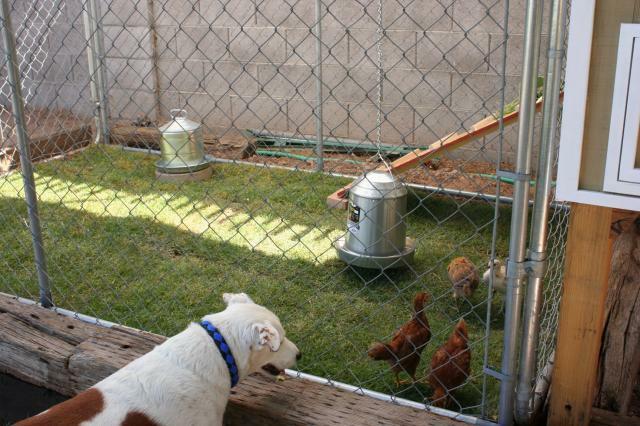 Our dogs were too rambuncous and eventually we locked them in another yard because it seemed as if they were stressing the chickens out, but this morning the dogs (and chickens) were a lot calmer and all coexisted under our watchful eyes. To be safe, we will not allow the dogs in this part of the yard until we reinforce the pen with hardware cloth about three feet up all around and block access to the area between the block wall and the pen. Brad is also going to put shade cloth up on that fence next to the block wall which will give them a "wall" at their backs and alow them a place to go under the ramp to feel secure in the yard. 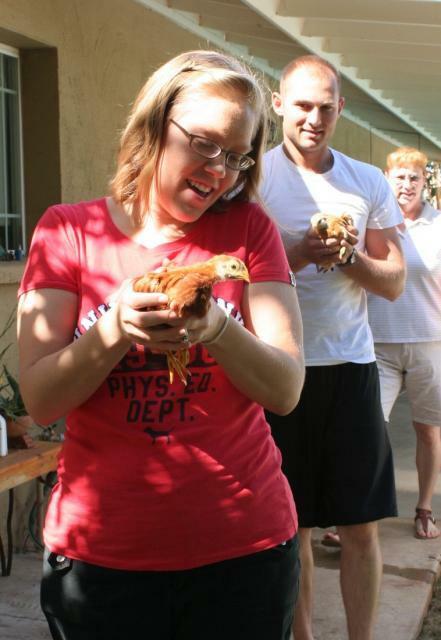 Thanks for checking us out - see more pictures of the coop & how it was built under the page "coop project-2009". 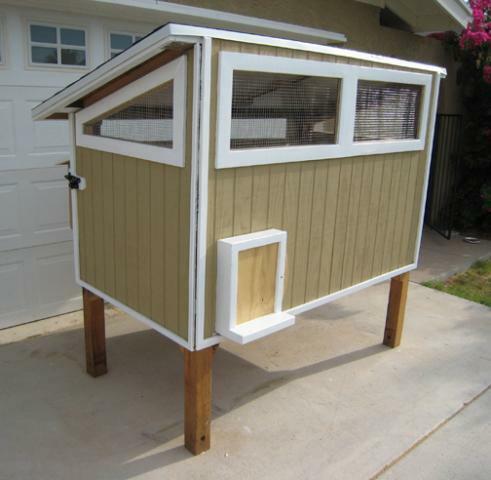 This is a really nice looking coop and it seems to be well built. Be good to have some details of the build: dimensions, pics, plans etc. because folks may like to build this one themselves. But would have liked to see more of the build and the inside of the coop. The other page didn't work. Maybe merging them both together into one article might help. "I couldn't get to the other site"
What a nice looking coop and run! I could not get to the coop 2009 page that you referred to in order to see how it was made. If I could have gotten there and seen your plans, materials, and other details, I would have rated this higher. Do you have snow where you live , if so how does the roof handle the weight of the snow? how did he fasten the kennel bars to the wood? 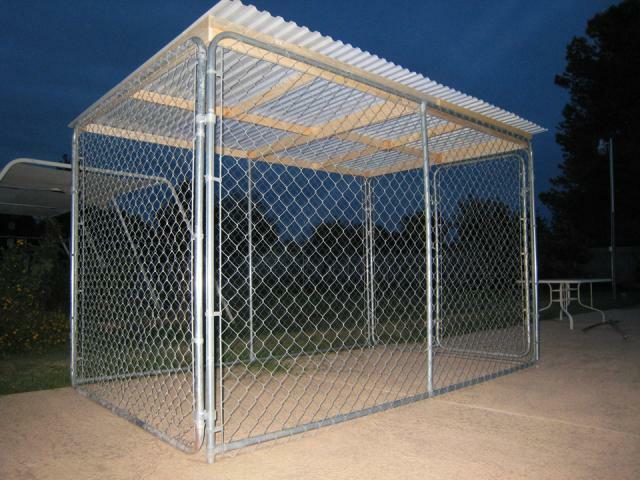 I have a kennel I want to use. 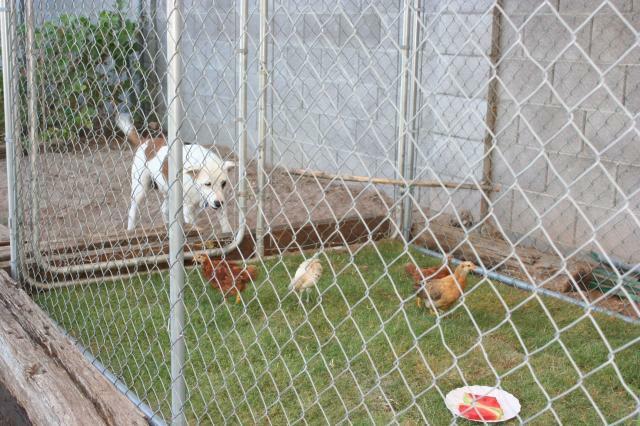 Great, our chicken yard is a dog kennel as well.